I have to admit that I am not a great fan of cooking, cooking shows on TV, or very expensive cooking appliances. This does not mean that I begrudge others the enjoyment of aforementioned cooking delights. I am just totally over hearing friends singing the praises of their Thermomixes! All joy to you if you want to spend $2000 on a glorified blender/cooker, but please spare me the gory details of your latest recipes for this infernal machine! I have friends that don't seem to have anything else happening in their lives other than the latest ingredients they whizzed and cooked. I have stopped following a couple of people on facebook because I got sooooo tired of their constant updates of things they found to Thermolize (I just invented that word by the way). I really and truly don't give a hoot about your latest curry or soup. People have been making curries and soups for millennia without having to wax lyrical about it on every second social media update. Don't get me wrong, I have nothing against Thermomixes per se, it is the adulation and vehement defense that goes along with them that is the issue. I love labour saving devices - my vacuum cleaner that saves me from dust bunnies, my automatic washing machine that means I'm not down at the river beating my clothes on rocks, my dishwasher that keeps my sink free from dirty dishes and all the other bells and whistles that first world living provides - but......I don't write about them on facebook every day and I don't take pictures of my washing in the spin cycle - I just quietly enjoy them and leave others to enjoy their choices too - broom or vacuum - who cares? Thermie or beaters - who cares? I've heard dozens of justifications for spending a bucket load of money on this machine and if you can afford $2000 then good on you - but please don't make it sound like the bargain of the century and please don't go on and on and on about how much better it is than the cheaper versions in the shops - maybe people who are not on your very comfortable income might like to try something similar without the enormous price tag. Feel free to whiz, puree, bake and saute to your little Thermie heart's delight but please also try to find something else to talk and write about now and then. I thought I was the only person in the known world who was not a dyed in the wool fan of "Thermie" (as their disciples refer to them). 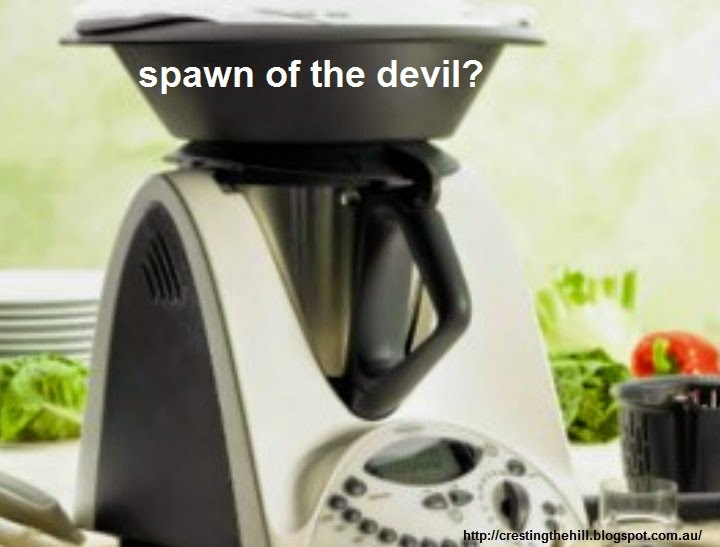 Fortunately, I recently found out that I wasn't alone (the last woman standing - still chopping with a knife) when one of my friends mentioned disliking the Thermomix hype - I agreed and called them the spawn of the devil (because they're taking over the world and brainwashing the masses) - she just laughed and laughed. It was nice to have moral support.